Following my short, but sweet trip to Amsterdam I headed back on the train to Schiphol to give myself two hours before my connecting flight. In retrospect I probably only needed to leave an hour as I was flying within the EU, which treats itself like its own country in respect to flying. At Schiphol I picked myself up a North America to EU outlet converter with which to charge my phone. I was so exhausted at this point I felt my eyelids growing heavy over my eyes whilst waiting at my gate. I passed the time primarily by making note of how well dressed all the Dutch men were, in oxfords and button downs and contrasted this with your average Canadian gent. My connection was made via Air Europa, one of KLMs sister carriers. My exhaustion got the better of me and I fell asleep as soon as I arrived in my seat, which meant missing out on hearing why my plane was delayed for thirty minutes before take off, following boarding. Though, honestly I was grateful for the extra half hour of nap time. The flight is a quick two and a half hours to Madrid. Upon arriving in Adolfo Suárez Madrid- Barajas I was confused as I didn’t have to show my passport again. I cleared this up later with some of my Spanish friends who informed me of the EU’s single country status I mentioned earlier. I had decided to take the metro to my hostel as it was the cheapest option. I had read in a few places that it is recommended to take a cab, as it can sometimes be unsafe to be seen carrying multiple bags on the metro, as well as inconvenient given all the escalators. However, I was not prepared to spend 15-20 EUR on a cab, given the convenience of a metro straight from the airport to Puerta del Sol, where my hostel was located. It is a bit more expensive than a regular fare from the airport, I believe about 5 EUR. For the record, I didn’t experience any theft my entire time in Spain and felt very safe travelling there. Arrving at the metro station in Barjas an employee was available to help visitors purchase their ticket and indicate where to make transfers. I had to make two transfers to make it to Puerta del Sol. The ticket machines are very easy to use, with an English option for us spoiled Anglophones. Though I had consulted with the employee regarding my transfers, perhaps it was the fatigue of travelling, or the excitement and confusion of a new place, I forgot where I was meant to transfer. This resulted in me wandering around Nuevos Ministerios accosting spaniards in English asking which train to take. This is not a tactic I recommend, as it is not well received. Eventually I was very grateful for the kindness of a security guard who directed me down the correct hallway and showed me on a map which station I needed to transfer at. It was fairly easy to find my hostel, “The Hat” from Puerta del Sol. The staff were are all very welcoming and spoke excellent English. I really enjoyed my stay at The Hat. It is very well kept and the care put into the decor helps to make it feel a little more like a home away from home. 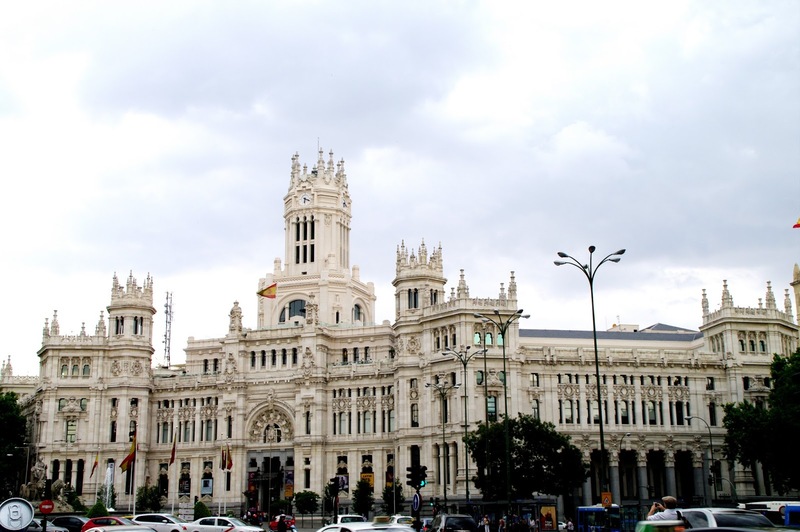 I chose the location as it is in the centre of Madrid and close to much of the sights I wanted to see. After renting a towel for 2.5 EUR and having a quick shower, I hastened to get out into the city and see Madrid, as I only had two days to do so before making my way out to Salamanca. The architecture in Madrid is beautiful. My first day was spent wandering around the city for a few hours before dark, taking in the stunning historic city. I had a fairly easy time making my way around Madrid. One thing that always drives me mad about Europe is the fact that street signs are bolted to the side of buildings, rather than directly on the street corner as in North America. I always wonder about people driving in European cities and missing these signs, which can sometimes not be seen from the corner of the street. As such, there were a few wrong turns taken, as tends to happen while traveling, though I made it around just fine and back to my hostel to sleep. I actually didn’t have anything to eat for dinner my first night. After acquainting myself with my hostel roommates (two Americans [from Utah, who thought Ontario was in Texas], two English girls and one French woman who demanded to know why I took her locker- for the record it actually wasn’t her locker, but rather another locker, which I was forced to take because someone had taken mine, though it didn’t really matter as we all had a place to keep our belongings safe) I fell asleep fairly early. I wasn’t really in the mood to try and order food in Spanish, especially following my metro communication nightmare. I feel as though as a Canadian I expect the entire world to speak English. Not because I’m surrounded by it everyday, or because it’s my language, rather because I’m surrounded by expats who all speak excellent English. Canada is incredibly multicultural and you’re very unlikely to find yourself in a workplace, class, coffee shop , anywhere with a group of people solely born and raised in Canada. Our country is made up of many different nationalities and I suppose growing up amongst all these expats who speak my language has led me to subconsciously, and falsely assume that English is taught and spoken everywhere. This coupled with the fact that I’ve travelled primarily to English speaking countries, or countries which cater to English travellers (i.e.. Mexico, France, UAE). The week I spent in Spain though taught me a lot about language and the impact of the English language. Tomorrow’s post will include more Madrid as well as my trip out to El Escorial.